Raising backyard chickens, or other poultry, can be a rewarding family experience, but it requires daily attention to keep your chickens healthy – and to protect your family. For their first 3 days of life, your chicks need constant light, so that they can locate their food and water. Box temperature should initially be 95-98°F. If your chicks peep loudly and cuddle together, they are cold. Your brooder should be large enough that the chicks are able to move away from the heat source if they are too warm. Decrease the temperature by approximately 5°F every week until the temperature is about 70°F. Fresh, clean water should be constantly available to your chicks. Change water daily. Chicks should be kept dry, getting wet can lower their body temperature to unsafe levels. Size your waterer appropriately, so chicks cannot easily climb into it. Keep waterers clean and add 6 drops of Oxy E-100 to each gallon of fresh water to prevent the spread of disease-causing pathogens. Add 1 HealthyFlock® Tab to each gallon of fresh water to target harmful pathogens and help improve intestinal health. Starting at 21 days of age, add 6 drops of Zyfend® A according to dosing instructions to offset worm-related issues. Select a ration that is appropriate for the age and purpose of your poultry. Feed should be fresh, clean and dry. Feed that is old and/or has been stored improperly, such as in damp conditions, can get moldy and pose a serious health risk to your chickens. Provide a source of grit for your chickens to aid in digestion of feed. Once your chickens have matured, they will need an appropriately sized coop, and ideally a secure, fenced-in, outdoor area to keep birds safe from predators. Allow approximately 2 square feet per chicken in your coop. Cover the floor with 3-4 inches of wood shavings or shredded newspaper. Fresh air is important, so the coop should allow for proper ventilation. Provide roosts for sleeping and boxes for nesting when hens reach laying age. An outdoor fenced area should allow for approximately 5 square feet of space per bird. Avoid overcrowding; it can lead to a variety of health and behavior problems for your chickens. Always wash your hands thoroughly after handling your chickens. Keep coops clean in order to maintain chicken health. 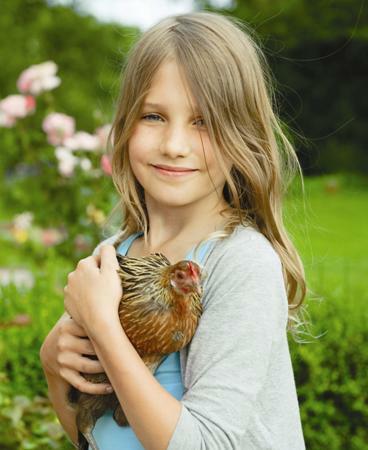 Backyard Poultry Magazine, April/May 2013 Issue: Healthy Guts…Healthy Birds…Healthy Families!